When I stopped to take a picture of this ridiculous looking fake tree/cell phone tower that is obnoxiously visible from way off in the distance, my intent was to post the picture on my blog and complain about how stupid and unattractive it is. But it's actually kind of photogenic in a way. It looks pretty dumb in real life though. Once I was out of my car with the camera in my hand, the compulsive picture taking disorder started once again. A couple of years ago they came in with bulldozers and completely destroyed what had once been a recreation area with baseball diamonds and things. They sprayed it with hay but it was just a big mud pile for quite a while. Gradually the vegetation filled in and it became a marshy area with a pond that seems to be very popular with migrating ducks. There were about twenty of them - they didn't all make it into the picture. I am guessing that they constructed this artificial "wetland" area to compensate for some of what the Inter County Connector will be taking away. They are building a gigantic overpass a little bit east of this area. It's really going to change the character of the area, but it was nice of them to at least make an effort to keep some areas friendly for wildlife. I hope it all works okay, because at this point we don't really have any choice in the matter. This is probably one of the most scenic bus stops in Montgomery County. I would imagine that waiting for a bus might be a little more pleasant if you had this lovely creek to look at while you waited. It's pretty amazing that some of the trees haven't even started to change color yet while others are completely bare. This is the "Road to Nowhere." That's what I used to call it when I was younger. I always wanted to see where it went. I think it was one of the old original parts of Bonifant Road. They've changed it a couple times and I guess sometimes it's easier to re-route the road than it is to widen an old bridge. You can't really tell to well from this photo, but it just heads off into increasingly heavy underbrush. After my husband saw this photo he told me he used to fish from this bridge when he was a kid. The creek there is Northwest Branch. So now I'm looking back across Bonifant at that cell phone "tree" again. I started thinking about my first official piano teacher (my mother taught me until I was about 12). His name was Harold Pries and he was really old. I remember driving up a very long curved driveway with lots of trees on either side to his big beautiful but slightly gloomy old house on what eventually became the former site of the Trolley Museum. I had never had formal piano lessons before when I started with Mr. Pries and my year of lessons with him was very interesting. Although he seemed to be extremely old fashioned, he had me work through several volumes of Bartok's Mikrokosmos along with the usual repertoire which included a whole lot of Bach. No more John Thompson for me! I memorized it, but I just couldn't get into the sentiment of it in my recitation. I was just a silly little seventh grader and I couldn't feel or relate to whatever this poem was about. I hadn't experienced doom and gloom yet. Well he gave me a demonstration of it that was so grim that I thought he might kill himself afterwards. It was pretty scary and very intense, but I was sort of impressed and amazed anyway. I think it was too intense for my mother though because she started looking for a new piano teacher for me pretty soon after that. All in all though I'd have to say that the weekly poem memorization experience was very beneficial to me in ways that I couldn't possibly appreciate then, but certainly do now. And I didn't know enough to have an opinion about his teaching, but I do know that he inspired me to work harder than I ever had before. So first it was the piano studio of Harold Pries, then it became the trolley museum, and now it's the ICC. The trolley museum has moved to a new location just on the other side of the ICC. I had heard it was due to open this weekend, so I drove on in to check it out. It's not open yet. They're still working on attaching the cables and they won't open until at least one of the trolleys is up and running. I asked one of the guys who was working there when it would be opening and he said that they were trying for next Saturday but he thought that was optimistic. I peeked inside the building. It's a lot fancier than the old one was and it looks like the exhibits are more attractive. From what I could see just peeking in the door. There was a road around the back that did not say "Do Not Enter" so I drove it up to the top of the hill. The light was really fading by then so this herd of deer looks rather ghostly. I took one more picture of the "tree" from behind the trolley museum. It's actually planted rather close to the new building, which you can't tell at all just driving down Bonifant. I guess I have a little more appreciation of this thing now that it has caused me to take a little trip down Memory Lane. Thank you, cell phone tree! Goodbye, Scenic Wheaton . . . . . I am so sad that one of my very favorite bloggers, Scenic Wheaton, has taken down her blog. She is an excellent writer who has had some very interesting experiences. She has swum across the Chesapeake several times, she speaks the native dialect of Switzerland, she works as a physical therapist to amputees at Walter Reed, she rode her bike all the way down to the inauguration, to name a just a few, and somehow she has managed to appreciate living in Wheaton, which is really quite an achievement. I loved the subtle humor that often accompanied her otherwise very earnest and thoughtful point of view. I'm really going to miss having her in my little blogging world. I hope she's okay. Maybe she moved or something. In my mind I tend to think of the bloggers that I read regularly as my imaginary friends. They are all real people but I've only ever met one of them in real life, so the rest of them just kind of float around in my head. I've sort of enjoyed this semi-anonymous, internet only, aspect of blogging, but now that I've lost one of my favorite imaginary friends I'm starting to think that maybe I should allow myself to be a little more sociable and less on the fringes of things. I'm quite comfortable there, but maybe I'll go to a blogger meetup or something after I finish my house. I guess I'm pretty attached to the blogs I read regularly. There's another one that I'm worried won't come back. She hasn't posted in a while, and I hope she doesn't disappear too. On the other hand, it's kind of selfish for me to have such expectations of my favorite blogger people, since I don't post very often myself. But I don't think it would matter too much one way or the other if I were to suddenly or gradually stop posting. 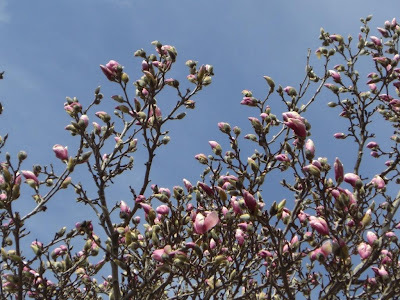 In a way, this blog has mostly been a bunch of fluff that I put together in an effort to cheer myself up during this annoying post-fire phase of my life. Maybe there won't be a need for that when the next phase of my life (which will not contain the word fire) begins. Who knows? 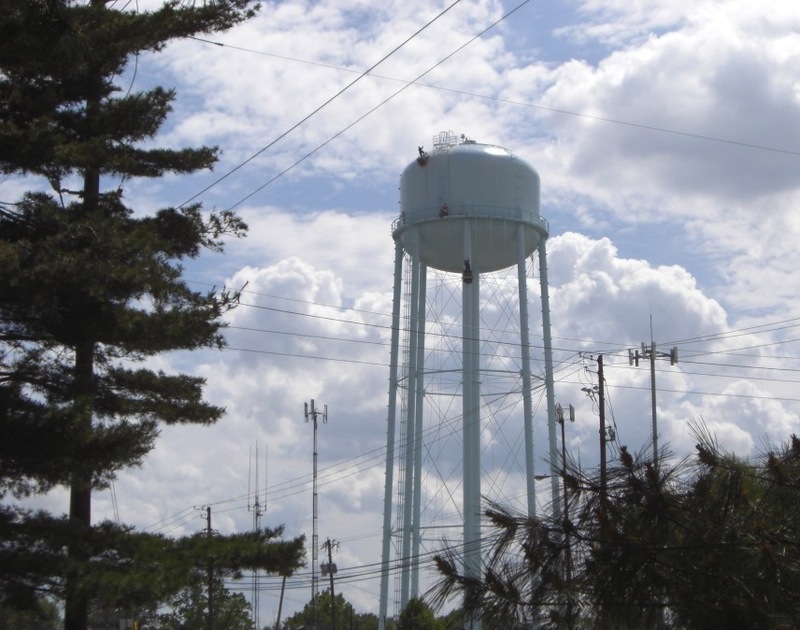 Anyway I miss you, Scenic Wheaton, wherever you are and I dedicate the photos below to your memory because you always seemed so enthusiastic about my silly water tower pictures. 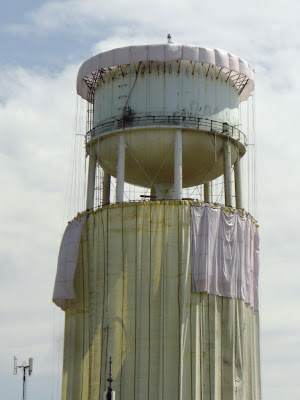 I did more than one post about water towers thanks to you. Here they are - Here, here, and here. 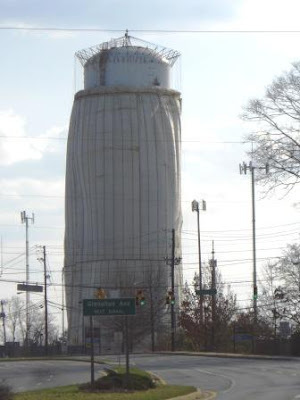 This spring they painted the Glenmont water tower. It was an interesting process that went on for a couple of months. I took pictures, but got busy with school or something so I never posted them. 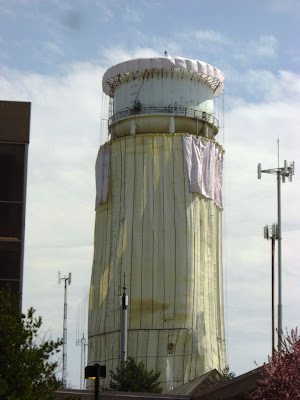 Before they repainted they had to sandblast off the old paint and the tower went through some interesting transformations during this process. It started wearing clothes. Nice skirt, or is that a dress? That's a cute little shower hat, and an adorable pink apron. Actually now the apron looks more like a cape. 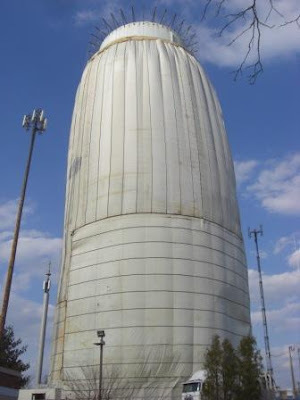 They raised and lowered that bottom section every day I think. I saw them doing it several times. I used to enjoy painting up near the roof of my house. 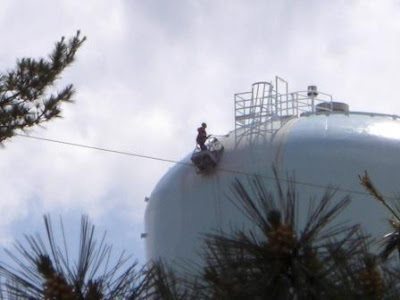 It must be really cool to be up on top of that water tower. I wonder how far that guy can see in the distance from way up there? It's all shiny and new now. It used to be more of an aqua color, but now it's a very pale blue - almost white. I always enjoy seeing it in the distance as I drive over to work on my house. Is it just me, or has the process of the leaves changing color been a little more spread out than usual this year? The maple in my neighbor's yard is just now beginning to reach its peak color. It was still green last week, believe it or not. As you can see below, the trees across the street are completely bare, and have been so for a while. I'm glad that the fall color has occured in phases this year. It seems to stretch out the time a bit more. So this year at Thanksgiving I won't be asking myself where the fall went. Instead I'll be appreciative that it has lasted for so long. So it was pretty much a done deal that we would take Monday off. I worked really hard on Sunday, caulking and painting and mowing the grass one last time. I discovered that the mulching attachment on the mower does a fantastic job of sucking up leaves if you leave the bag on. We headed out so early that the fields on Rt 198 still had their morning mist. We had planned a little side trip to the Oxford-Bellvue Ferry because I really wanted to take a boat ride in my car, but they only run on weekends starting in November. But that's the dock back there behind the tree. I wonder if that tree is a descendant of the famous Wye Oak? There was a singing seagull hanging out on one of the poles near the dock. The water there was kind of oily, probably from the boats, but it made an interesting background for these leaves. This giant red ball was decorating the gate post at the end of someone's driveway near the ferry dock. 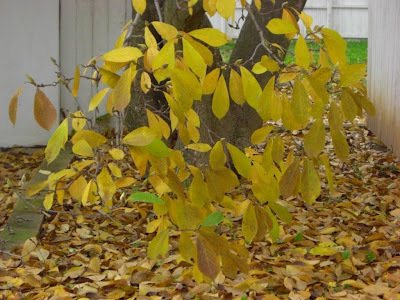 When we saw this persimmon tree, Doug insisted that we stop and have a taste. The fruit tasted like a mixture of peach, apricot, and mango, with a whole lot of nutmeg added. Doug said this was a highly unusual persimmon in that it had virtually no puckeriness. It was pretty good. I was surprised that he didn't pick a bunch of them to bring home. We saw this lovely sweetgum tree. I think fall is farther along in DC than it is on the Eastern shore. 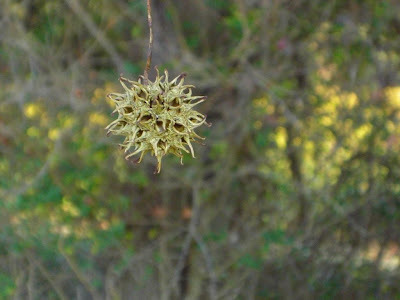 The sweetgum tree had these balls hanging from it. After we passed this sunny sorghum field, we stopped at the St. Michaels Perk for breakfast before hitting the highway once again. Finally we arrived at Assateague. 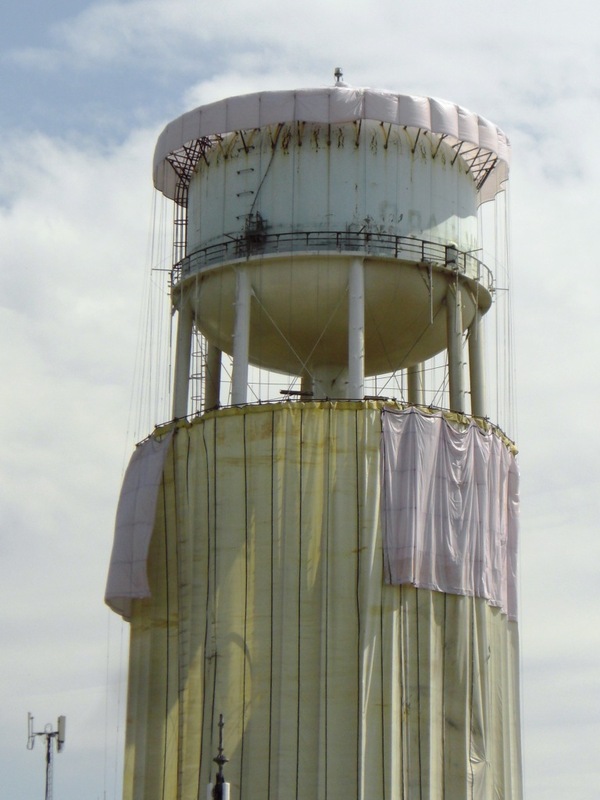 By then the temperature had risen to right around 70 degrees. Everything looked so clean and fresh. I've never seen the horses manes look so white. I guess they had gotten a lot of rain recently. We had the beach practically all to ourselves. We were there from noon until about 3:00. It felt wonderful to be in that lovely light and to breathe that fresh ocean air. I don't usually have very much to do with seagulls because one pooped on my head at Rehoboth one time. But on Monday there weren't too many around, so I decided to make friends with this one. He was very clean and white. If you've never seen seagull feet closeup, now's your big chance! I decided to entertain myself by taking a video of the seagull. Of course he poops a little bit right at the end of it. That's what I'm talking about! We were without internet for over three weeks, until today, and it has been a royal pain. I didn't realize just how much of my day to day functioning is internet-based. But now I've kind of gotten used to living in isolation. It's not too bad. I have a lot more time to do other things. And the course I was taking over the internet has unfortunately pretty much fallen by the wayside. No more straight "A's" for me I guess. Anyway, that is why my posting and commenting and visiting of other blogs has been kind of light lately. I need silence and my separate keyboard and my separate screen and my trackball in order to be truly functional at the computer. Using my laptop at Panera, parking outside my friend's house in the middle of the night, or sitting on her couch at more reasonable hours still leaves me feeling spastic and unable to think. Also, I haven't yet memorized all (three) of the html things I use for blogging. While I was feeling sorry for myself about the internet situation, I started pondering some of the other inconveniences that have been added to my life after everything went up in flames over four years ago. The main thing is what I alternate between calling the cinderblock cell and the cinderblock chalet, depending on my mood. We've been renting this house while we get our real house, FoamCoreFantasy, back into liveable condition. It was not my idea for it to take this long, but that's another long story. The cinderblock chalet is small, and that was fine at first since we had just lost more than 90% of our belongings. And I was on the road or working on a ship for most of the first year so I wasn't really bothered by that or by its ugliness. In fact I like small - it's very easy to keep things neat and tidy in a hotel room or a cruise ship cabin. Ugly is a little harder to take. The kitchen and mud room in the rental house are kind of late 70s trailer home or hunting cabin style. But at least it has a washer and dryer. Speaking of mud, it is impossible not to track things in. The house is built on a slab at ground level and there's no sidewalk up to it so leaves, dirt, and other debris are always finding their way in. I'd have to vacuum every fifteen minutes to keep the floor clean, and that's impossible. Some of the things we don't have are related to our "temporary" situation, so I guess I shouldn't complain. We don't have a TV, but we don't really have time to watch one right now either. I just drive the 5 miles to the nearest Blockbuster when I feel the need to stare at the screen for a while. We don't have a land line phone, so when our wireless goes out we can't get online. We don't have trash service. We have an oil tank for our heater which never seems to get filled before it runs out. It takes at least twenty minutes longer to get anywhere in DC than it did from my "real" house. 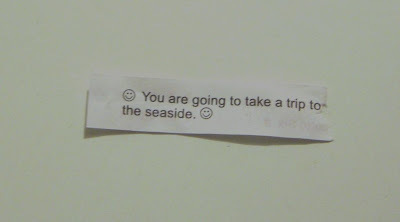 But it takes less time to get to Baltimore, so that's good. Never Have an Ordinary Day! My days are weird enough already, thank you very much. I've always found that when I need cheering up, cookies and milk do the job quite nicely. I don't keep cookies on hand because that's kind of the last thing I should be eating, but I'll go buy them if I get the urge. So for two years I somehow found myself buying those Pepperidge Farm cookies on a nearly daily basis. What can I say, I was pretty miserable and cookies cost a lot less than drugs or alcohol. Fortunately 7-11 has them in a two-pack and they come in a bag of eight at the grocery store, so it's a large amount of excess calories, but it's not nearly as much as a normal sized bag of cookies. And it is more comfortable to "only" eat two cookies, or eight, or sometimes six, if I was feeling generous. 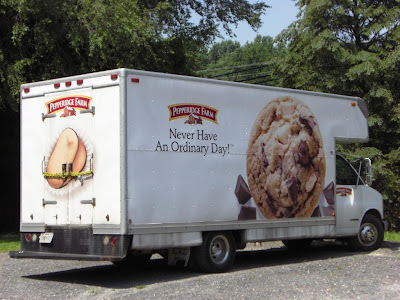 Anyway, I recently noticed that I haven't had the urge to buy Pepperidge Farm (Chesapeake, if you must know) cookies for about six months and that may very well be how long the truck has been gone. I tried (and apparently failed for the most part) to not see it, so I didn't notice exactly when it stopped being there. I remember glaring at it each morning, already regretting how my day would undoubtedly end. I'm really glad that stupid truck is no longer parked there. I need to have ordinary days, without the cookies. The school buses that park there now don't seem to be activating any food urges, so that's good! And here's the same tree in the fall. I definitely like this tree even more than I like cookies!